Spiky leaves and brilliantly colorful flowers make these perennials a favorite. 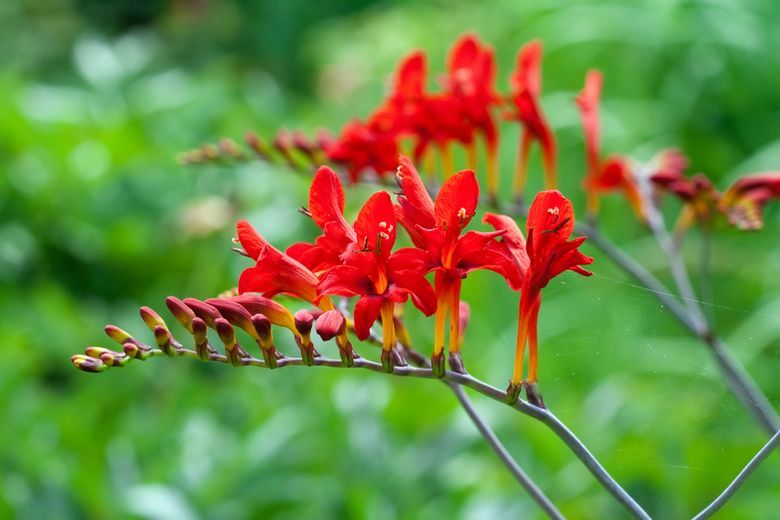 IT ISN’T SURPRISING that so many Crocosmia have diabolical names. These hardy iris relatives from South Africa are devilishly attractive perennials, featuring spiky leaves and brilliantly colored flowers that are irresistible to hummingbirds and humans. Crocosmia blooms come in fiery shades of orange, red and yellow. The flowers appear in June, July or August, depending on the variety, and are produced on slender stems of 2 feet or more in length, with buds that open one by one over a long period, from the bottom up. The beautiful displays usually last for at least a month, and the blooms make excellent, long-lasting cut flowers. 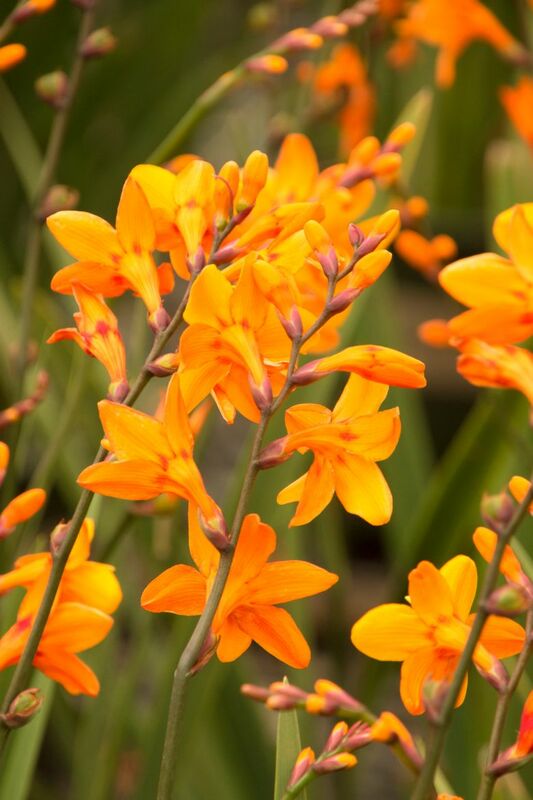 The only real devil when it comes to Crocosmia, and the one variety that should be avoided, is the low-growing, orange-flowering Crocosmia x crocosmiiflora. For years, this rambunctious spreader was the only Crocosmia available. It not only overruns and smothers neighboring plants, but also quickly becomes overcrowded and fails to bloom well unless it is divided every couple of years. 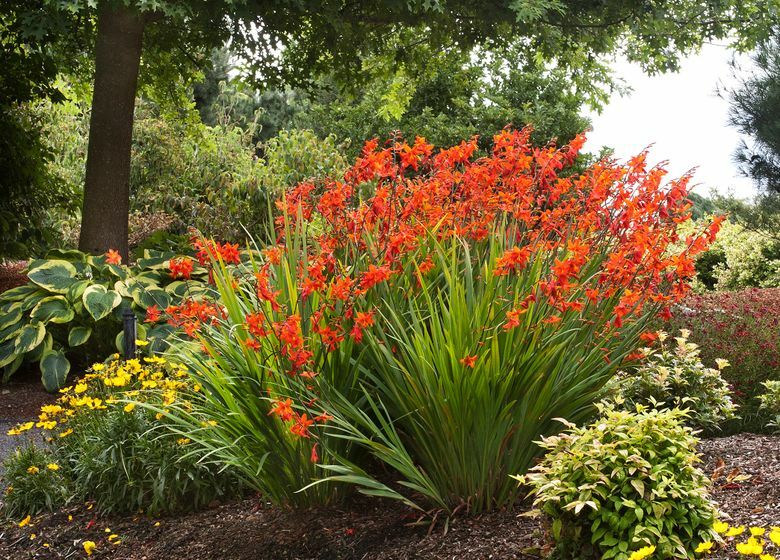 Fortunately, thanks to intense breeding programs, there are now more than 400 varieties of Crocosmia to choose from. Most offer more-refined growth habits and reliable blooming. Crocosmia ‘Lucifer’ is a popular variety. 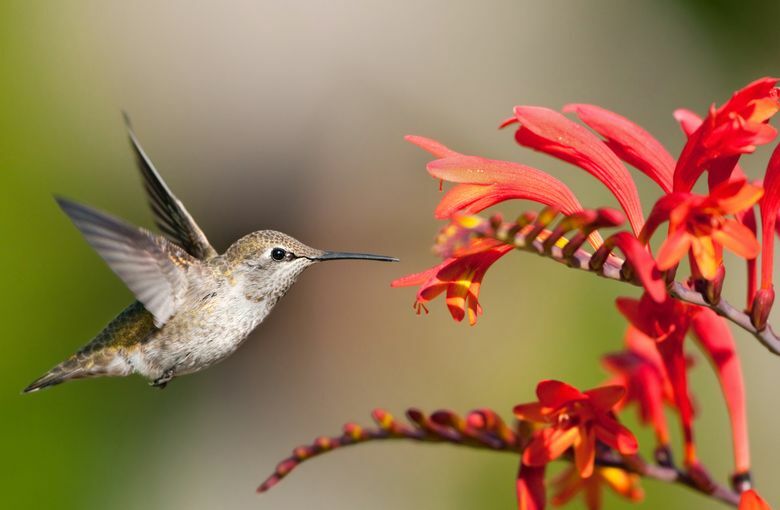 It’s a hummingbird magnet that produces brilliant, scarlet-red flowers on arching stems that can reach more than 4 feet tall. Although it’s a reliable bloomer, it requires staking, and can become trouble if you don’t divide it every few years. A better choice might be ‘Hellfire’. It grows to only about 3 feet tall and spreads slowly, and the sinfully gorgeous dark-red flowers are much bigger and more upright than on ‘Lucifer’. If you want to avoid staking altogether, give the newly introduced ‘Diablito’ a try. This little devil has scarlet blossoms very similar to its bigger cousin ‘Lucifer’, but is much lower-growing, with upright, arched stems. Of course, there are Crocosmias without demonic names that are every bit as gorgeous. For big flowers, ‘Star of the East’ wins the bragging rights in the genus. The enormous, golden-orange, red-spotted blossoms can reach 4 inches in diameter. When it comes to orange flowers, another stunner is ‘Fern Hill’. This one sports attractive 3-foot-tall pleated leaves and pumps out numerous arching stems cram-packed with glowing, yellow-orange flowers. A longtime favorite in my garden is ‘Solfatare’. I’d grow this August-blooming beauty just for its elegant 24-inch-tall burnished bronze leaves, but it’s the golden-apricot flowers held on stout, slightly arched stems that make this a must for every garden. Even more exotic is my recent acquisition, ‘Dusky Maiden’. The 28-inch-tall leaves on this new introduction are smoky copper, and the flowers (that I have yet to see) are purported to be a gorgeous blend of mahogany and terra cotta with a yellow eye. Oh, la, la! As long as you give these lovely perennials plenty of sun, regular watering and relatively well-drained soil, they will bloom extensively every summer. Even slower-spreading varieties, however, can become overcrowded, which can cause reduced blooming. If that happens, or if you just want to start a new colony, divide them by digging and separating the corms before growth starts in early spring. Crocosmias are rarely attacked by slugs and snails, and are generally pest-free. They do have one problem, however, that can ruin the show: In hot, dry summers, the leaves can turn an unsightly brown and dry up right as they begin to bloom, ruining the flowering display. That’s a sure sign your Crocosmia is infested with spider mites. Prevent this problem by spraying the leaves regularly with your hose nozzle. Use just enough force to dislodge the mites without blasting off foliage and flowers. Wetting down the foliage also increases humidity, creating a less-inviting habitat for the mites. One or two sprays a week is usually all it takes to exorcise these demonic troublemakers so that you and your hummingbirds will be able to enjoy a divine display of long-lasting flowers every summer without fail.